For those of you who are GPS and digital camera buffs, you should definitely check out this program. 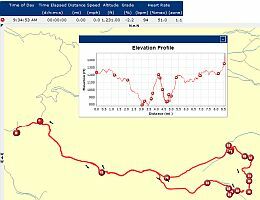 RoboGEO v2.1 was recently released with support for Google Earth, and does an excellent job of taking a GPS track and georeferences your photos taken during the track. It's pretty straightforward, you simply: 1) tell it where the photos are; 2) tell it where the track is (supports several formats); 3) tell it the time offset between camera and GPS; and then it georeferences the photos that match the track. You can then generate the Google Earth file and even label all of your photos and add descriptions. 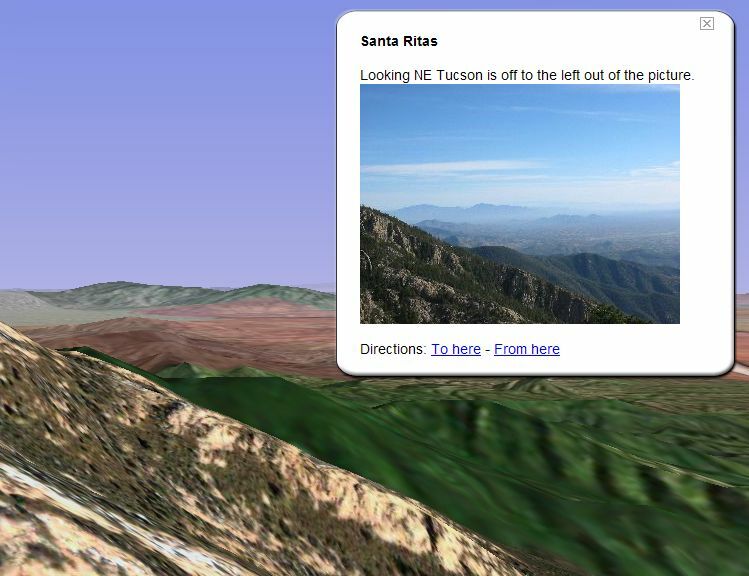 For example, I took the photos from my recent Arizona backpacking trip (which I wrote about earlier) , and used RoboGEO to produce this Google Earth file (WARNING: this is a 2MByte file). You will see the track in red, green placemarks for the photos, and a bunch of entries in the placemarks pane. You can click the photo placemarks and see photos and descriptions to get a sense of our trip. In particular, on some of the scenic views I tried to duplicate the view in GE from the photo (double click on a photo placemark to see this). RoboGEO gives you several options for saving your GE file with or without the images in the file. This is important because if you put a lot of full-size images in a GE file it will be huge. The file I've created uses scaled down (using another program) to 320x240 images so the resulting GE file is only 2 MBytes in size. Alternatively, I could put full-sized images on a server and the GE file would be really small. If you have a good collection of photos and GPS tracks that go together, I can highly recommend RoboGEO. 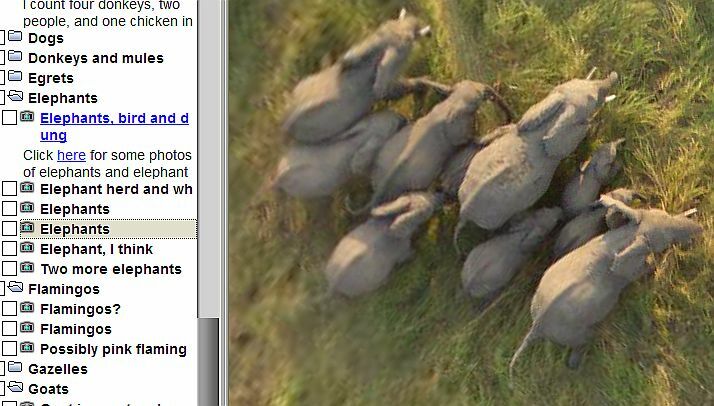 Especially if you want this quality of Google Earth output. RoboGEO prices start at US$34.95. 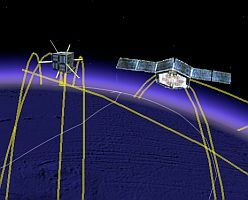 Some amateur radio enthusiasts started out by creating an extensive Google Earth network link which showed the current positions of amateur radio satellites. Next they provided a great deal of information about the satellites in their descriptions. Then, since they already had the technology, they went ahead and compiled information on nearly 800 satellites including: military, global positioning system (GPS), Globalstar, International Space Station, Hubble Telescope, and more. They also did an excellent job of using folders to organize the information. Once you download the network link you will see a bunch of orbits, you will want to make sure you are zoomed out far enough to see everything. Go to the placemarks folder loaded and open it until you find and open the selected "amateur satellites". You can click on the list of satellites to see descriptions for each satellite. Some of the satellites have really nice color icons (they say you may need the latest beta for this). I recommend you turn off a category of satellites (select the folder and choose "Hide Contents") before you turn on a new category or just select an individual satellite. 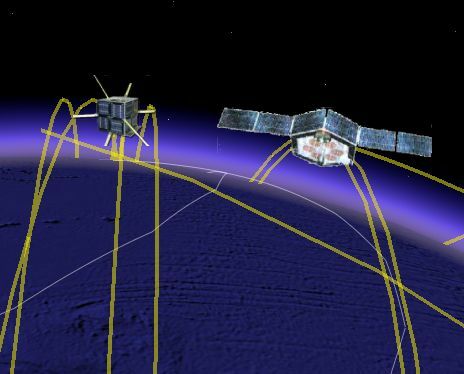 If you turn on a bunch of satellites, it's really too much information to digest. Try playing with different angles to get some really interesting space shots. This is great work guys! 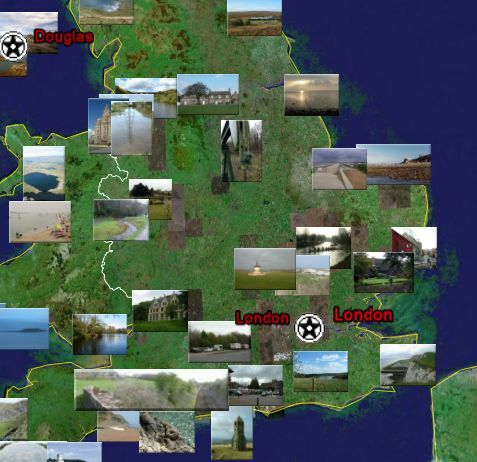 Geograph.org.uk has a straightforward mission: "collect a geographically representative photograph for every square kilometre of the British Isles". This is not such a simple objective to accomplish. But, thanks to a free and open setup, the help of hundreds of photographers, and an interesting mission, they are well on their way to achieving their objective. Recently, Geograph released the ability to view search results as KML (Google Earth files) so you can see the placement of the photographs from within Google Earth. You click on the green "KML" icon when its available to view the results. Or, you can go to their Google Earth search page and click on "Download KML" after selecting the type of search you want to perform. This is a formidable project and I'm sure a Google Earth interface can only help encourage interest. They could make the interface with Google Earth even better if they were to create a network link to show a sample of the searches as I've written about for Flickr images (where the 50 nearest photos are shown to your current view). 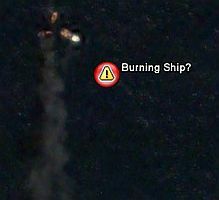 Google Earth Sleuthing - Burning Ship? It's amazing what the combination of Google Earth's huge resource of satellite and aerial photos and the Internet can do. A few months ago someone noticed a very small satellite photo of a remote area of ocean near Iceland where a boat or ship appeared to be burning with some other boats nearby. 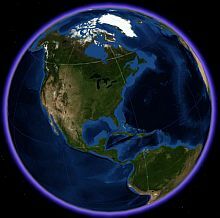 'earthling_andre' posted a placemark and his thoughts at the Google Earth Community. A bunch of people speculated, and then a few weeks later someone named 'solskin' posted that the satellite photo was indeed showing a burning boat, and the one occupant was rescued by the two boats in the scene. He posted a link to a news story in icelandic, which was followed a few days later by an English translation found here. Apparently two helicopters also came out to help as well. What I find interesting is that a scene of drama is captured in a random satellite photo, discovered by someone browsing, and the mystery is solved by people all over the world. Amazing! According to Kathryn Cramer, the Global Connection Project has released high-resolution aerial photography dated 25-October-2005 for viewing in Google Earth at this location. There are 760 NOAA images of areas affected by Hurricane Wilma available in the collection. These images are confined to the Florida Keys and west and central Florida (none for Cozumel yet - which was probably much more seriously damaged. Of course, NOAA is a US Government agency, so image would have to come from elsewhere for Cozumel and that area). I downloaded the Google Earth file and perused through the new images, but I could see little sign of damage. (But, I'm not a damage assessment expert - although I had no problem noticing damage in the Katrina photos). I looked for downed trees and boats knocked out of docks. But, in the 20 or so photos I looked at I didn't see any. The good news is that there are some nice high res images of areas not covered by the base Google Earth database available for viewing here. You'll want to download the 4Kx4K images for maximum resolution viewing, but be aware they will take longer to download and will take up more memory (so dont open too many). Casper at Thinklemon.com has released a couple of new variations on his collection of Impact Craters (aka Craters) which I wrote about earlier. He announced on Monday this week Google Earth files for the most recent impact structures and the oldest impact structures. You should read his announcement because he provides some perspective on these new variations. Or, if you are impatient, you can download the most recent craters , or the oldest craters now. Kathryn Cramer, who became well known in the Google Earth community for her efforts surrounding Hurricane Katrina relief efforts, has also been working on the Pakistan Earthquake relief efforts. Kathryn has a well-written blog where she helps by providing an international information resource. She in particular has been working with the Global Connection Project (a team of folks from Google, NASA, Carnegie-Mellon University, and some other Universities as well) to try and help get better satellite photos available to relief workers. Kathryn has announced that an initial set of high-resolution Google Earth image overlays for the earthquake areas has been released by the Global Connection Project. She has included screen shots as well. Believe it or not, for a brief while, the UN removed all satellite photos after Pakistan officials warned about the political sensitivity of the area. You can read about this in a recent Nature magazine article. Fortunately, sanity prevailed and they are now allowing the photos. Considering the remote areas where the Earthquakes have hit (and are still hitting, there was a 6.0 Earthquake just on Sunday in the area), these photos are critical to help relief workers determine where roads are damaged and where populations exist which might need aid. During WWII U.S. Navy submarines accounted for over half the total ships sunk of the opposing forces. One of the Google Earth forum moderators put together an excellent tribute in the form of a well-constructed Google Earth file which marks the location of 52 U.S. submarines which sunk in the act of duty during the war. 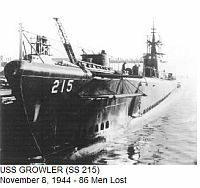 Each placemark was carefully researched and provides details about the ship, photos, and a list of the men who were lost. The author of this GE File is known as "Chief_Sparky, EMC(SS) USN, ret.". Here is the post where he released this collection. He obviously has a personal as well as historical interest in this information. And as one of Google Earth forum moderators he was well positioned to do such an excellent job. Here's a collection of mostly high resolution Hurricane Wilma imagery in the form of Google Earth image overlays. The latest image is turned on, click on the other placemarks one at a time to load the other images. Many of these images are very large (3500x2500 pixels in some cases), and may take a while to load depending on your connection. However, these are some of the nicest true color images over the last several days available on the planet. 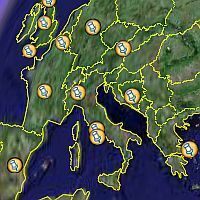 Also, you should check out this collection of storm tracking tools from a variety of Google Earth users. 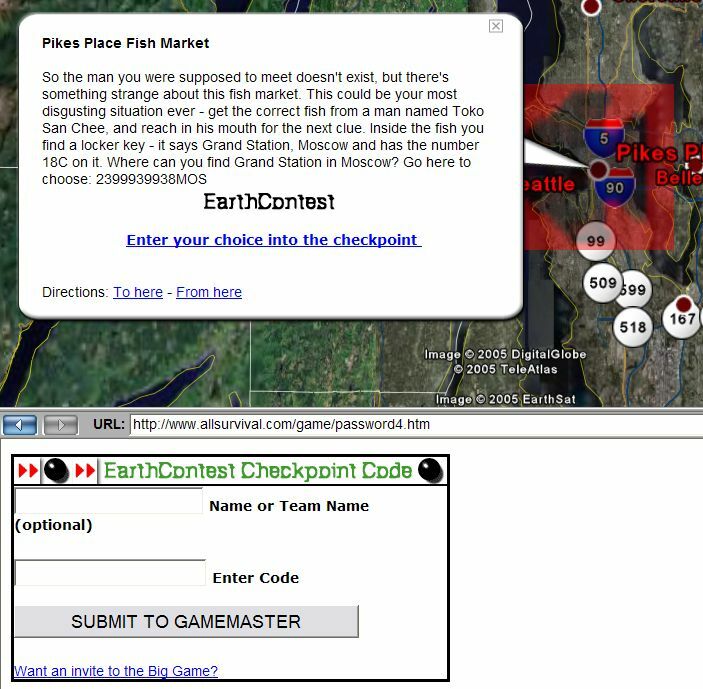 Here are instructions for getting the Google Earth network link for Geocaching.com: You have to have at least the free basic account on Geocahing.com, log-in and click on "My Account". 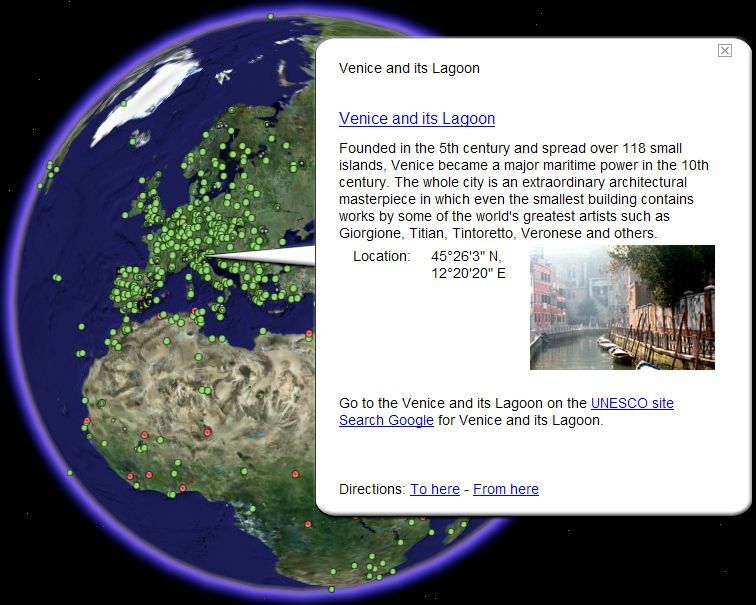 In the lower-right of the page under "Google Mapping Features" click on "Download Geocache browser in Google Earth". This will download the network link into Google Earth (assuming you have GE installed). Once you have the network link downloaded, you will see "Geocaching Network KML" in your Places folder. I recommend you move it from the "Temporary Places" to your "My Places" folder for safekeeping. Next, just zoom somewhere in the world below 500 miles out, pause a few seconds, and you will see geocaches for that view. 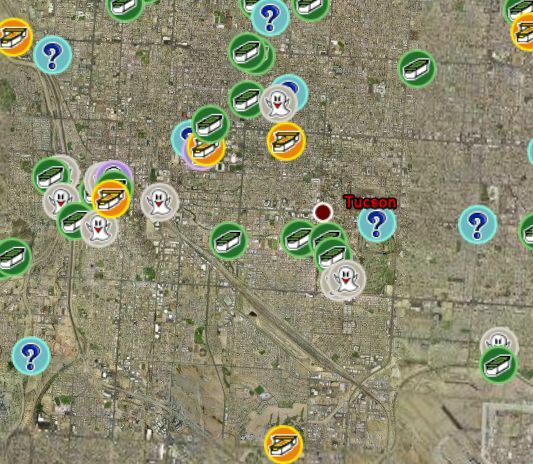 Groundspeak has made nice looking placemarks for the different types of geocaches. If you click on a placemark you get a brief description and a link to the cache page with all the details, or you can bookmark it for future reference at the web site. This is a highly useful capability (read the things you can do with this in my first geocaching story). I"m glad Groundspeak is officially supporting this capability. By the way, I'm told you are limited to 150 caches in a view and can only refresh the network link 200 times in a day. You also are able to download a static KML for a specific cache. 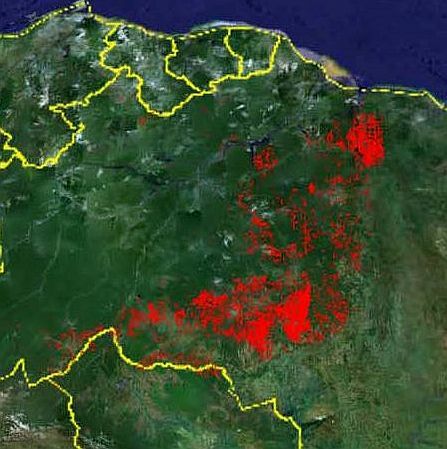 A research paper has been published by the Carnegie Institution of Washington which reveals the amount of tropical forest degredation due to logging has been underestimated by half. Loggers have been secretly entering the forests and selectively cutting down trees under the tropical forest canopy one by one. The scientists have developed a method to penetrate the forest canopy and using computational methods combined with on-ground studies they can detect the forest degredation. Carnegie’s Dr. Gregory Asner says: “Selective logging negatively impacts many plants and animals and increases erosion and fires." This photo from the research paper shows a Google Earth screenshot with an image overlay showing the extent of the selective logging. Dr. Asner was unable to provide the Google Earth image overlay to me at this time due to publishing issues. I hope this research paper helps raise awareness of the terrible destruction of countless species of plants, insects, and wildlife due to logging. There is also scientific evidence that deforestation is damaging our atmosphere (carbon dioxide). Google has quietly released a new beta version of Google Earth - version 3.0.0693. I'm told this version is largely focused on bug fixes and robustness. (Perhaps Google is getting ready for going out of beta with Google Earth?) They have not yet made available release notes, so I can't tell you what fixes and enhancements have been made. I will update this entry when I have more details. At the moment, you can download it by going here. Here are the new improved release notes. As you can see, there are not many new features. My favorite is the image overlay option now respects the original image aspect ratio. Some people are probably not going to like the change in directory for the cache, but maybe you can still point to the old one if you need to. According to Jeff's Weather Blog yesterday: "The pressure at the center of circulation has fallen to 882 mb. This is the MOST intense hurricane on record in the Atlantic Basin." The storm has reduced some in intensity today, but is still a fearesome Category 4 storm. Over the last couple of days, I've been posting some image overlays from some of the best high-resolution satellite photos of the storm at the Google Earth Community. I am making several satellite photos for Google Earth available here . I suggest you turn on just one image overlay at a time as they are pretty big pictures and will take up some memory. The 500m resolution picture is particularly large and may take a while to load (depending on your bandwidth). 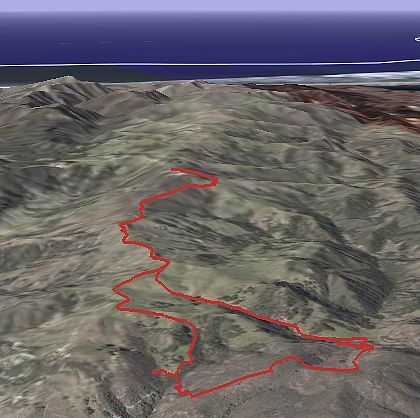 Just ran across the most powerful GPS track visualization tool to date. 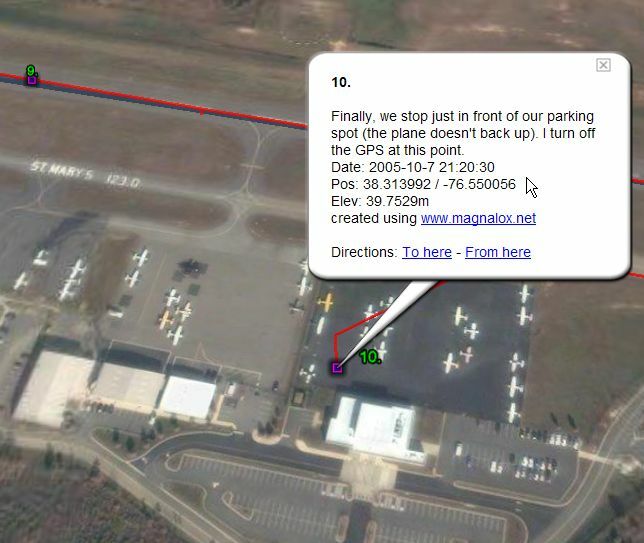 The Magnalox.Net web site allows you to upload your GPS tracks and turn them into amazing visualization tools. Volker Kinkelin in Germany has created some of my most-wanted visualization tools including: animating your track (while showing speed and height graphs), colorization of your data (according to height or speed), automated geotagging of photographs taken during your track, and it allows you to perform story telling during the track. And, of course he provides the ability to view your track and story from within Google Earth. As an example, I quickly uploaded the recent flying trip I wrote about here last week. Magnalox calls your uploaded tracks "magnalogs". Once you load my magnalog it will immediately begin animating through the track. Below the graphs you can read my commentary for each event along the trip. You can just step through each story entry (under "Goto Story") for greater control of the story. By the way, Magnalox is free to use, and has many powerful features. 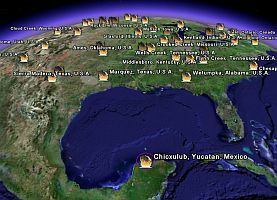 For example, if you click on the animated cursor in the log it allows you to open that waypoint in a variety of mapping tools including: Google Earth, Virtual Earth, Google Maps, Topozone, Multimaps, MSN, Geocaching.com, and more. Amazing! Great work Volker! Volker also has written a powerful Pocket PC application which lets you interface your PDA with a GPS and uses the display to provide visualization of your track, integration with points of interest databases, and, of course, simple integration with Magnalox. 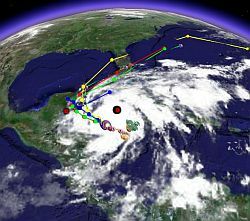 With another Category 5 storm to watch (Hurricane Wilma) this is a good time to remind people that Google Earth can be a powerful tool for tracking storms. Here is a collection of automated storm tracking tools for instant use within Google Earth. These tools allow you to see the track and forecasts for all current tropical storms around the world. They also give you access to nearby towns, webcams at those towns, satellite photos (water vapor, infared, visible), spectral scans, sea surface temperatures, global cloud maps, and more. Also included is a variety of published data including winds, barometric pressure, and much more. [Edit 20-Oct-2005: added Global NASA dynamic data including SST, Rainfall, and wind magnitudes. From pdchawaii]. Over the last few millions of years the Earth has had quite a few impacts from meteors, asteroids, and maybe even peices of comets. Scientists have confirmed 172 locations on the Earth determined to be "impact structures". In fact, the leading theory for the mass extinction of many animals, including the dinosaurs, 65.5 million years ago was an impact crater known as the "Chicxulub crater". These locations have been documented in a database available at the Earth Impact Database. 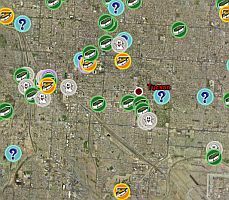 Thinklemon.com has taken the Impact Database and created Google Earth network links (he gets extra points for this) which not only shows the location of the 172 impacts, but shows a size indicator for the larger ones and provides links to Wikipedia articles and other information in the descriptions. He has organized the list by major continents and also includes a list of the top 25. Here is his announcement with his links, or you can download the entire collection now. This is a very nice collection, and since I have a degree in astronomy myself, I just had to write about this. Great job Caspar! By the way, a good friend of mine has spent over 20 years as an astronomer helping to find near-Earth objects which may someday strike the Earth. He works at the Spacewatch Project at the University of Arizona. If anyone with lots of funding is looking to help us make plans to avoid a major future impact, Spacewatch would be a good project to fund. NASA's "Blue Marble" is a beautiful series of high-resolution cloudless pictures of the Earth from space. Their most famous version was generated in 2002 and has been used widely by a variety of programs including NASA's Worldwind product (which is similar in many ways to Google Earth). Recently NASA released the Blue Marble Next Generation. This new version is higher resolution (500 meters verses 1km in the previous version), and includes 12 different versions for each month in the year. How they managed to get a cloudless photo for the entire earth every month of the year is a miracle in itself. And they are beautiful photos! Now you can view Blue Marble NG [EDIT: WorldWindCentral took away this feature] in Google Earth as well. 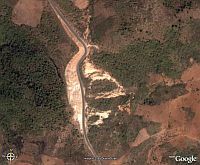 Thanks to the efforts of the folks at WorldWind Central, they have created a Google Earth file which uses network links to download Blue Marble NG photos based on your current view. Once you download their link, you can select which month you want to view by opening the "Blue Marble NG" folder in your "Temporary Places" folder. I recommend you unselect the "2004-12" and select another month for your first viewing (due to the large number of people viewing the default month it is kind of slow). Make sure you try zooming in to load higher resolution pictures from Blue Marble (new images will load after you pause a few seconds after zooming). The implementation for Google Earth is pretty good. But, there are some stitching problems (you can see edges to some of the images), and I suspect they will be having some bandwidth challenges with this type of implementation. But, I'm sure improvements will be forthcoming, and this is definitely worth looking at even if you just go to the NASA site and look at the examples they have there. As with the recent hurricane disasters in the Unitied States, Google (and its Google Earth users) have worked to try and help the Earthquake efforts in Pakistan. In my opinion, Google is doing a very good thing by helping relief efforts in this way. Even though Google Earth is just a beta product, the fact it is free and is supported by Google's very robust servers and databases makes it an ideal tool for these types of applications. That and the fact it is such an easy to use geographic visualization tool. First, a Google staff member dedicated to the Current Events forum at the Google Earth Community called montana_morrison has collected a number of earthquake related posts with useful information here.. This includes UN Damage Assessment data, seismic and tectonic shake data, and more. In addition, Google worked with its space-based imaging partner Digital Globe to create a collection of higher-resolution imagery for the most affected areas in Pakistan. You can read their announcement here (dated October 14th) and it includes instructions and links for downloading the high resolution pictures. You should probably only open a few images at a time as they will take up a lot of memory. By the way, I don't believe these images show post-earthquake data. They are just releasing the higher resolution data to help people on the scene see better. The Register has announced the winners of their "Spot the Black Helicopter" contest using Google Earth. Their competition results story includes dozens of photos and interesting commentary about the photos. Winners get a t-shirt with this logo on it. The story includes some wild speculation about a high resolution photo "discovered" in Zanzibar Africa and tries to compare this to the lack of high resolution data for the White House. Do your homework Mr. Journalist. There are 500 high resolution photos of Africa in Google Earth courtesy of their arrangement with National Geographic which has been well publicized. Duh. The other disappointing thing, I found no link to a KML with placemarks for these discoveries. The Register has been doing a lot of sensationalistic journalism around Google Earth and its being able to find pictures of Military and Intelligence locations. Apparently to great benefit as witnessed by their successful contest. Still, I'm glad more people are finding out about our favorite application. 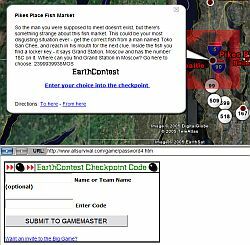 A few days ago a new Google Earth game came out called "Earth Contest". The game claims to be an "online reality game where players face extreme challenges and face their worst fears all while trying to beat the GameMaster." You are given clues in the form of placemarks and words, and choices appear in the placemark descriptions. You get codes to enter into a browser form and these lead you to choices which are based on mostly geographical clues (like "Windy City" or "Puget Sound"). Simply go to the Earth Contest web site to get started. All the instructions and a tutorial are on their pages. The game is free to play. They say if you beat the Gamemaster you can advance to the "Big Game" where you can win "big rewards" (none specified). The web site does have some online advertisements, but nothing flashy or annoying that I saw in my brief test. Some sort of method of scoring and/or ability to compare your progress to other people would be more game-like in my opinion. This is certainly the game with the most integration with Google Earth to date. An interesting concept which I will have to explore a bit more. I ran into a scripting error, but it didn't seem to effect the play. I'm going to need to add a Games category soon. A young man named Jason Howard contacted me a while back asking for advice on making a video showing various placemarks in Google Earth. He had a video showing his visits to various places in Japan he wanted to share. Apparently, he got the idea for his video from a guy named Matt Harding who has made videos of his dancing in various famous places all over the world. So, Jason decided to do the same thing in his foreign travels. The only difference being that he wanted to use Google Earth to illustrate the locations in the video. You can watch Jason's Dancing Video, and you can visit his web site. You can also go to "Where the Hell is Matt?". Matt Harding has apparently made the news with his original idea. Jason thought it was fun too. A collection of placemarks showing all 788 of the UNESCO World Heritage sites was first published at the Google Earth Community forums a year ago. The World Heritage sites include things like the Statue of Liberty, Grand Canyon, Timbuktu, etc. Having a site marked a World Heritage Site can greatly improve tourism as I witnessed down in the Caribbean. The first release of this collection was for Keyhole and was published in October 2004 by "aladdin" here, but the links are now kind of broken. Then shortly after Google Earth beta first released someone called "Herrminator" wrote a script to enhance the collection with better descriptions, photos, and even the sub-sites (those Heritage sites which have multiple locations). You can download the improved World Heritage sites and make sure you click on the placemarks to read the descriptions. Here's the forum post where Herminator keeps his collection. By the way, some of the locations of the placemarks apparently are incorrect. This is a problem with the World Heritage's own database, not the GE file. If you find an incorrect location of a placemark, contact the people at the World Heritage web site and let them know. Herminator occasionally re-runs his scripts and updates the collection and will capture any corrections. Writing a story about this collection slipped through the cracks as I was preparing to create the Google Earth Blog this summer, I just assumed I had written about it. It is definitely worth checking out, and if it isn't already in the Wikipedia, I will add it. 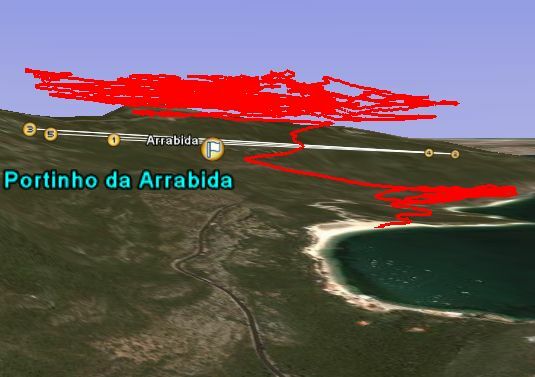 I just discovered that the Paragliding Forum has added Google Earth support to its database called "Leonardo " which allows people who record their Paragliding/Glider flights with GPS technology to submit and share their flights. The picture here shows a flight near Portinho da Arrabida, Portugal. You can see the list of flights in the Leonardo logbook here. After you bring up the list, simply click on the Google Earth icons in the far right column under "Display" and you will bring up each track. By the way, when I say "huge", we're talking about 791 currently displayed flight logs from all over the world. Amazing! 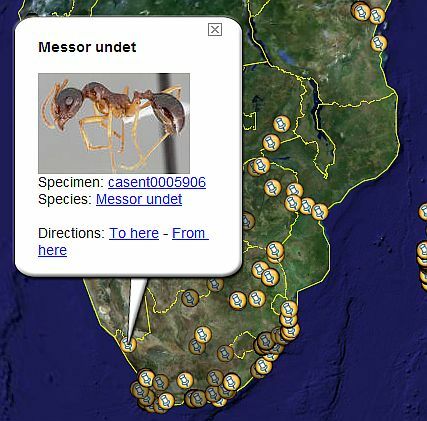 There have been some discussions at the Google Earth Community trying to find and categorize the animals in the pictures from the National Geographic Megaflyover of Africa collection. Someone named "Reggie98" has posted a really nice collection which has the animals categorized according to type and put into placemark subfolders. You can find: elephants, hippos, goats, flamingos, seals, and more. You can look at his post here. 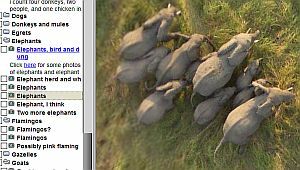 Simply open the folder "African animals" and you will see the list of animals, or click on the photo icons as you zoom across Africa. This is a more informative and organized way to examine these wonderfully detailed photos from the National Geographic collection. I hope Reggie98 continues to collect more details from the 500 photos included in the Megaflyover collection. Wired magazine has recently (their October issue) published a story called "Better Directions" which talks about the effects Digital Mapping is having on the world. The author illustrates how McDonalds used GIS systems starting in the 1980s to figure out where best to build. The article also talks about Google Earth and the amazing potential it has to revolutionize the business and consumer view of the world. Finally, the article correctly points out that some of the information can be overwhelming, or worse, harmful. It's not a long story, and worth a read. This weekend I flew my family from our home airport in Sanford, North Carolina to St. Mary's Airport near Leonardtown, Maryland. We went for a visit with some family and drove up to see the Annapolis Boat Show (to look at sailboats - see here for why we do this). There was some rain along the way, but the conditions were still fine for an instrument-based flight (IFR) both ways. I just downloaded the GPS track from my GARMIN 60C, and converted it to GE using some tools so it shows the altitude of the flight (see my earlier story about flight logs). 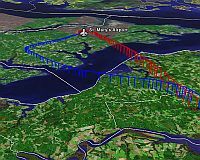 You can see our flight in very good detail (blue on the way up, red on the way back). While we were flying back, we had a few moments where clouds let us see the ground and I took some photos. Later this week I will georeference the pictures and maybe create some overlays just for fun. By the way, it was a really rainy trip. The boat show was wet, wet, wet. But, it wasn't very crowded so we got to see lots of boats and the salespeople were happy to talk to us. For those of your who are pilots, you can check out some interesting things. 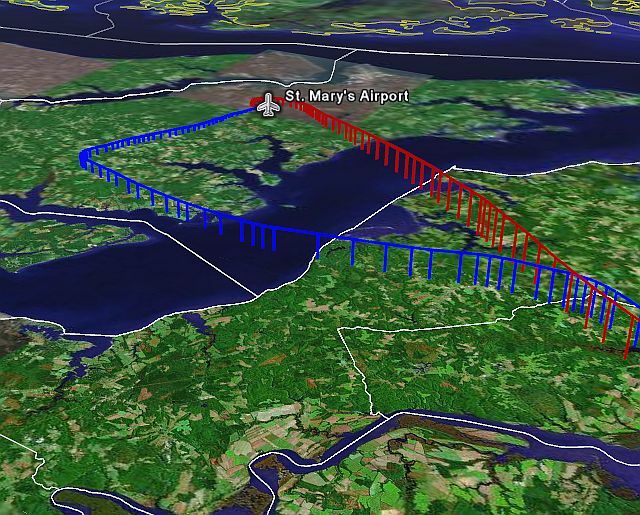 I flew the GPS RWY 11 approach into St. Mary's (2W6 - see the link provided in the placemark) and you can see where my autopilot made the turn to acquire the final approach. The autopilot was going a bit slow to make that sharp turn so I flew things manually (hence, we had a bit of a curve as I was closely monitoring the two steps-downs in altitude required by the approach). We were in the clouds and nearly down to 1800 feet before we first started seeing the ground. It wasn't until we were less than 3 miles out and down to 1000 feet when we had a clear view and I spotted the airport. I quickly cancelled IFR and we landed. On the way out this morning (the red line) we had a clear opening in the sky with clouds all around the airport. I was able to make a sharp right circling ascent over the airport and stay VFR (free of clouds). Then I called into Patuxent approach and picked up my IFR clearance as we climbed above the clouds to 8000 feet. We were directed by Raleigh approach to veer around RDU's airspace (same as on the way up) and then were given vectors to the ILS runway 3 approach into Sanford. We landed safely both times, they were good flights! 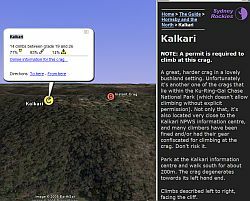 The SydneyClimbing.com web site released a Google Maps mashup which allows you to view their database of climbing sites in and around Sydney Australia. The map mashup is pretty nice with lots of placemarks, good information in the descriptions, and a link to their full database details. But, what is really interesting is the ability to see the same database in Google Earth. 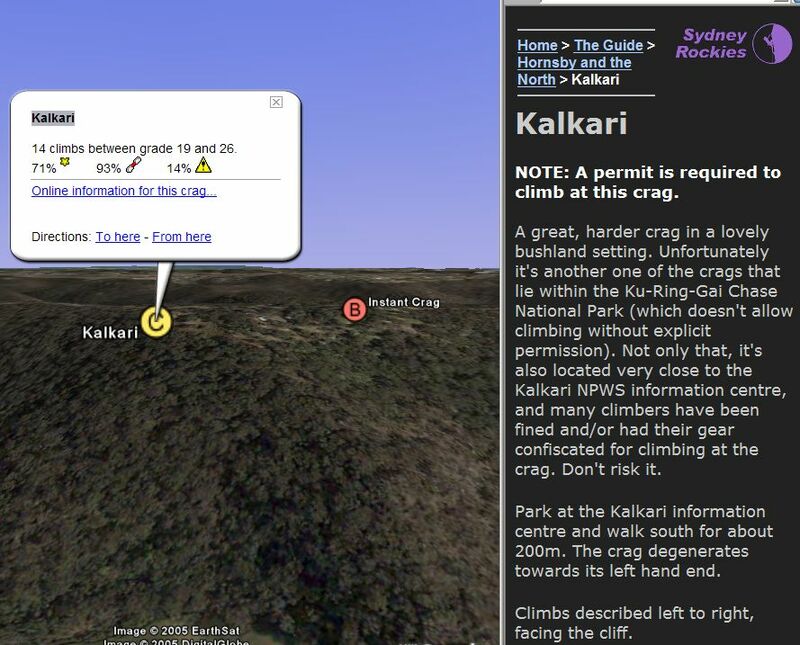 Click here to see their GE Sydney Crag data. I guess you have to do a maps mashup for those people who don't have the bandwidth or computer for using Google Earth. But, GE is a far superior interface for an application like this. Being able to zoom into a climbing location and then tilt the view to see the layout of the terrain does so much more for understanding where the better climbing might be. Of course, with the level of detail in the default 3D terrain of GE you usually can't see the detail of the crag itself, but it's certainly better than the top-down only view Google Maps provides. This climbing site is an excellent application of both Google Maps and Earth, and is definitely worth looking at just for tips on how to do things well. If you're a member of a climbing club, you should definitely think about doing something like this for your favorite areas. I would suggest adding topo map image overlays to the GE version to make it even more useful. Via Google Maps Mania. 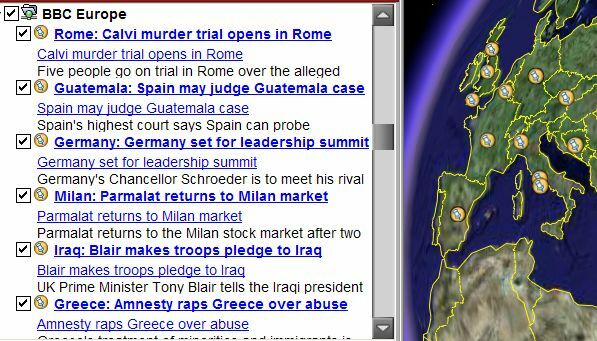 Many people first find out about Google Earth through some interesting current event in the news which is best illustrated through this versatile Earth browser. 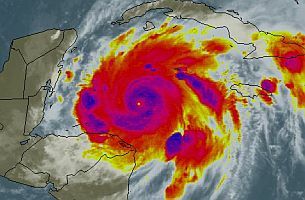 For example, millions saw Hurricane's Katrina and Rita using GE. It's easy to add your own RSS feeds to Newsglobe. You simply add a new "network link" under the Newsglobe folder. First you copy this: "http://www.daden.co.uk/cgi-bin/newsbot/newsglobe.pl?url=" into the "Location" field, then append your RSS feed link after the "=". Turn on your new entry and it will automatically scan the provided feed and show you the stories whose locations it guessed. You can read Daden's instructions at the link above. Every story also includes a link back to the authors - Daden Consulting. Smart business move! In the future, I'm sure news organizations will start georeferencing all of their stories and making files available to earth browsers and other mapping tools. 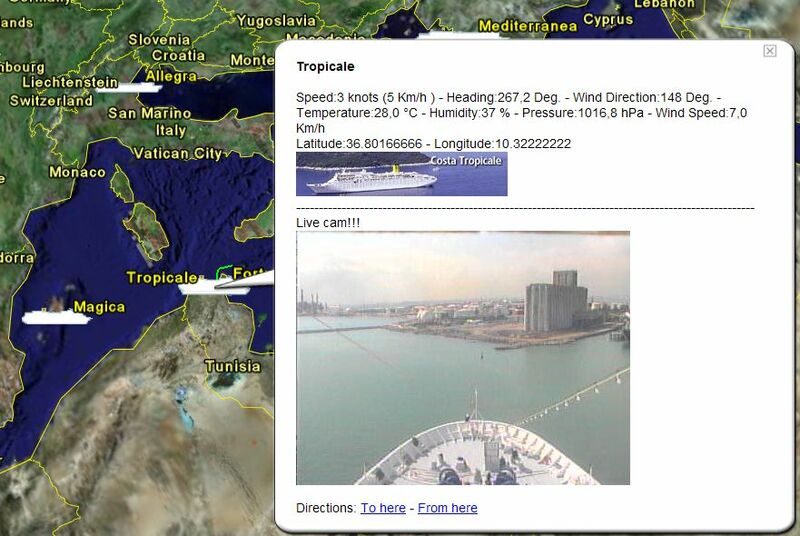 Costa Cruise ships ply the Mediterranean waters, now they ply the Google Earth Mediterranean. This network link shows the current position and recent tracks of the Costa Cruise Ships. When you click on a placemark you get current weather conditions for the ship, and a current "live" webcam photo from the ship. It's interesting to check in every few days and see the different locations the cruise ships are located and the resulting web cam picture. Some of the ships are experiencing bad weather, but don't worry - I'm sure there are plenty of fun things to do inside the ship. Put the link in your My Places folder and it will automatically update with the latest position and the latest web cam photos. I'm not sure if this was created by the company themselves (found this in this post), but I think it is a good way to advertise the Costa Cruises. It would be even better if they included some quality marketing photos through the network link for each location automatically based on the ships current position or destination. You may read stories about Taiwan complaining about its representation in Google Earth. But, the problem is with Google Maps more so than Google Earth. In Google Maps, if you type Taiwan, the result on the map simply says "Taiwan", but the location is described as "Taiwan, Province of China". Taiwan is in an uproar and wants it changed to "Republic of Taiwan". 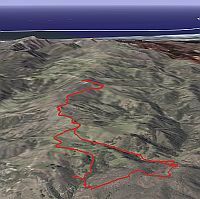 However, in Google Earth both the map and the description simply reads "Taiwan". One of the first to break the story was The Register, and they probably helped stimulate this misconception. So, many of the headlines are wrong unless they say "Google Maps". Garmin, the largest maker of GPS systems, has announced it has acquired MotionBased Technologies, a popular developer of software and web based applications for GPS devices. This was a significant move for Garmin, because their application MapSource mostly provides the most basic functionality for manipulating your GPS device tracks, routes and maps. In fact, I'm surprised I had not discovered MotionBased myself. According to their blog in the 15 months since they released their first beta, they grew to over 11,000 customers and 150,000 activities (by this I assume they mean GPS tracks). They emphasize fitness applications like mountain biking, running, and hiking. But, it can also be used for any other activitiy where you might carry a GPS. 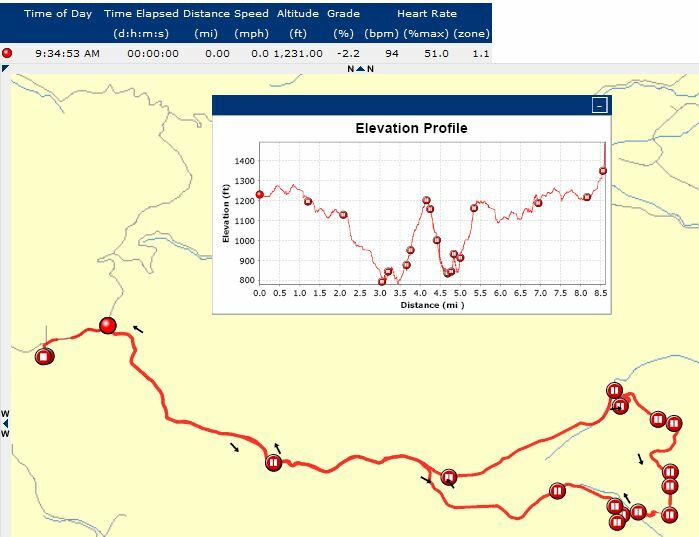 Their applications basically make it easy to upload your GPS tracks and be able to visualize the tracks against maps; analyze and chart your elevation changes, speed, and duration; and many other tools for analyzing your trip/run/bike/etc. MotionBased added the ability to output your track first to Keyhole and was one of the first applications to support Google Earth. So far they just upload the tracks into GE (the picture here shows the same track as the one above in GE). At least that's all I've seen so far. I'm hoping they take greater advantage of GE features such as network links, placemarks, inputting charts and data as well. MotionBased provides both free and subscription based services. The free service basically is limited in features and scale, and any serious user would want to upgrade. Currently it costs either $12 a month or $8 a month if you commit to a year. I've used a variety of public domain resources to accomplish some of the capabilities MotionBased provides (see my story here). But, MotionBased makes it much easier and has more features already. I think Garmin has made a very smart move. And the guys at MotionBased are probably walking on clouds. I hope Garmin treats them well. In this puzzle game you have to find the place belonging to a picture from somewhere in Google Earth. Over 60 puzzles have been played so far, and 7 of them still haven't been solved. The picture included here is the oldest (single image) puzzle yet to be solved. You can find these puzzles at GoogleEarthing.com. Apparently there is a prize for those who get the image location right first (a GoogleEarthing.com coffee mug maybe?). Sometimes GoogleEarthing publishes mutliple image games where you have to get several images right. Similar guessing puzzles have been posted at the GE Community forums, and in fact there is a forum dedicated to "Fun and Games" for just this purpose. But, GoogleEarthing is a more formalized and better organized way of playing. Plus, you get a prize! The Google Blog released a story today by Brian L. Fisher, Associate Curator of Entomology, California Academy of Sciences about his web site Antweb. This web site would normally be of interest mostly to Entomologists, providing specifications and specimen photographs of those sometimes pesky little critters known to most as "ants". What is interesting is that Antweb has created a network link to access their georeferenced data for where specimens were collected in Google Earth. And, actually its kind of interesting to browse the numerous links around the world and click on a placemark to see if there is a picture. You then follow the link provided to the Antweb web page and you may see high-magnification specimen photos. Some of these ants look like they belong in an alien scifi horror movie. This is definitely worth a download, but be forewarned. They have a huge number of placemarks and they download all of them for the entire world at once. It may cause your application to get slow for a minute while downloading and viewing placemarks. I would suggest they use a view-based query link to show just the placemarks for a smaller area of the world you are viewing. 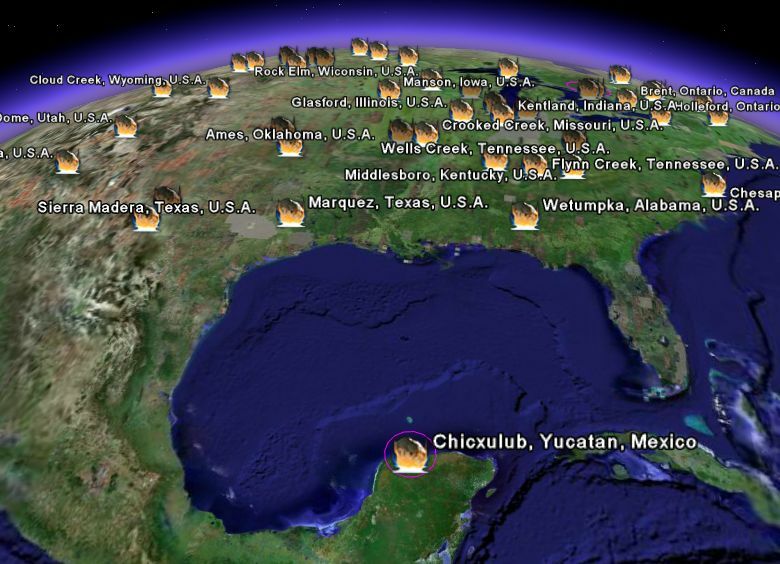 Still, this is an amazingly good application for use with Google Earth. Way to go bug guy! Oh, and the bug guy was so glad to get help from Google with his project that he named an Ant after them: Proceratium google.